We are a leading Manufacturer of industrial scissor lift table from New Delhi, India. 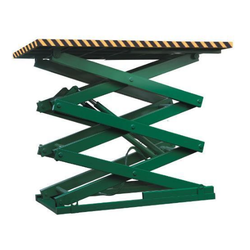 Industrial Scissor Lift Table offered by us is extensively used in different industry sectors for meeting the varied material handling operations. These lift tables provide high-quality automated lift solutions as demanded in the industrial and warehouse working environment and can be made available in numerous configurations including lift heights and load bearing capacities so as to best match with the specific working application needs of the customers.